Hydrangeas prefer full sun to partial shade as well as moist but well-drained soil. Regarding feeding, we recommend using Bio Tone or Bone Meal when planting to help establish the root system and then use a good all around fertilizer from then on. 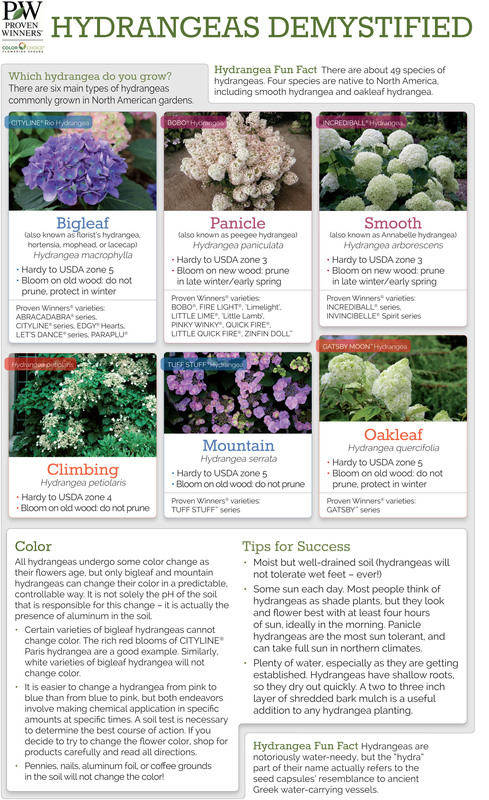 Also, depending on which fertilizer you use, you can change the color of the blooms on many varieties of Hydrangeas. Acid soil will make your blooms more blue while a non acidic soil will result in pink flowers. You can use Aluminum or Iron Sulfate to add acidity to your soil and lime will neurtralize the acidity to turn your flowers pink. Keep in mind that this is not something that happens overnite and will take time to get into the soil and the plant and effect the color of the bloom. Why isn’t my Hydrangea flowering? 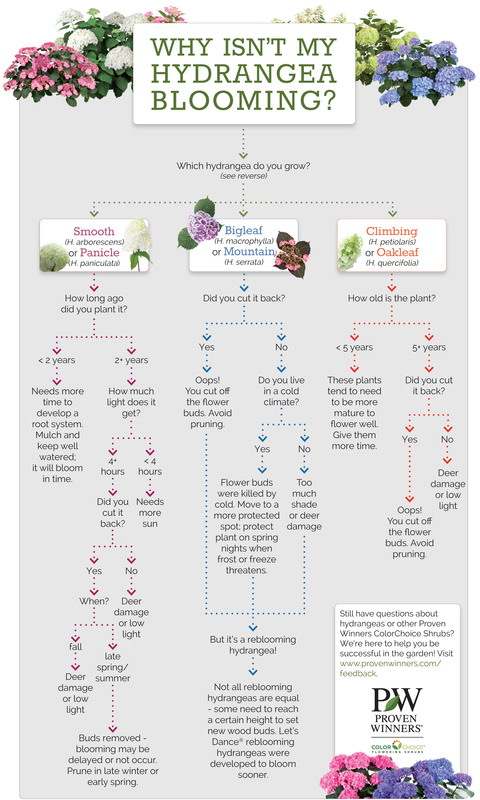 There are a few reasons why hydrangeas may not flower. The most common is frost damage. Another common reason is late pruning. The easiest first thing to check if your hydrangea is not blooming is where it is planted. Be sure that the area is getting enough sunlight and if it is planted where it will get high exposure to wind and other weather elements, it may be best to find a more protected location. Incorrect pruning is the #1 reason that hydrangeas do not bloom. Panicle hydrangeas should be after winter has started or in very early spring. Big Leaf varieties should be pruned right after flowering. I bought two Annabelle Hydrangeas at the Latham Hewitts early this season and up until about a week ago, they were doing great! They are sited in the same sized extra large containers, with drainage and appropriate soil, on each side of a gated entrance. The one on the left is blooming, the one on the right appears to have something happening at the base that has killed one stem and is slowly causing others to die. Ideas? Bring back the unhappy one and get another? Individual stems browning at base and then falling over, not whole plant at once. Vicki, It sounds like it might be drowning in that container. Always feel the soil before watering…If it is moist 2″ to 3″ deep, wait a day or two and check again. Also be aware that they will never survive winter in those pots. Repeated freezing thawing, refreezing and rethawing will kill it. They’ll need to be removed from the pots and planted into the ground before winter. Hardy plants in containers, even large ones rarely survive winter. That’s why you don’t see it being commonly done.